The thirteenth happened to be very unlucky for the people who owned this house/church in Loleta. 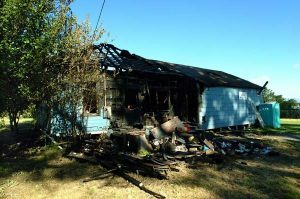 An unattended fire in a wood stove started a house fire, and the Ferndale Volunteer Fire Department was called to assist in putting it out. This was my first actual fire call, and since I had just received some training on Tuesday on pump operations with Company #1, it was interesting to see everything in action. Since I’m not officially a firefighter yet, my main duty was to watch the portable pond they had set up and co-ordinate the dumping of the tankers. Since much of this area is rural with no hydrants, a portable pond is set up which looks sort of like a doughboy pool. The tanker trunks then dump their full load of water into the pool where it can be pumped by the pumper trucks while the tanker heads to the nearest hydrant to refill. By the time Ferndale’s crews got there, the building was pretty well engulfed, and an attic full of junk made it very hard to get the fire out. They think they may try an save the church section, but the house was a total loss.